Yup! Amateur Astronomer, that's me! 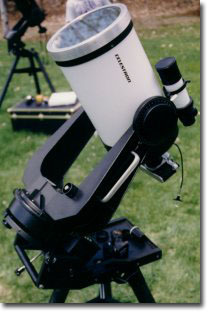 I had a Celestron Ultima 8" Limited edition (All white) scope. Good fun. Yet another money-pit hobby. The most enjoyable aspect of the hobby IMHO, is astro-photography. Especially eclipses when I am lucky enough to catch one. So far no totals, but I'm working on it. The image on the left is a composite of all the images I took during the May 10, 1994 annular solar eclipse. Once you get into astronomy, and you spend thousands of dollars on the scope of your dreams, you realize that you spend most of your time using the binoculars that cost you $200. If you have binoculars at home but no scope, pull them out and go look at Jupiter. You might be surprised to see some moons nearby! My Celestron Ultima 8 inch limited edition Schmidt-Cassegrain telescope set me back a cool $2300 and was worth every penny. Well, almost. I must say if you are looking into getting a scope, get one that you don't mind carrying around. This beast comes in a beautiful suitcase/trunk that weighs about 70 lbs, and BARELY fits in my car. The reason I bring this up is because this marvelous instrument gets used about 1/10 as much as I would like, because its just too damn heavy. This picture was taken just before the May 10, 1994 Solar eclipse. Hence the mirror-like solar filter on the front of the scope. I have seen some amazing things with this little marvel, most notably an annular eclipse, many lunar eclipses, Comet Hyakutake, Countless nebulas, galaxies, and clusters, but no UFO's yet. Sadly I have sold my scope. I the demands of life with a house, two kids and two dogs were too much, and I figured someone wles should enjoy it. Hopefully I will have another in the future. I Still go out some nights with the binoculars and just lie in te yard looking to the heavens. My Celestron Ultima 8 inch limited edition Schmidt-Cassegrain telescope.